You experience more of the world on a bike than from inside a car. Pedaling is just fast enough. 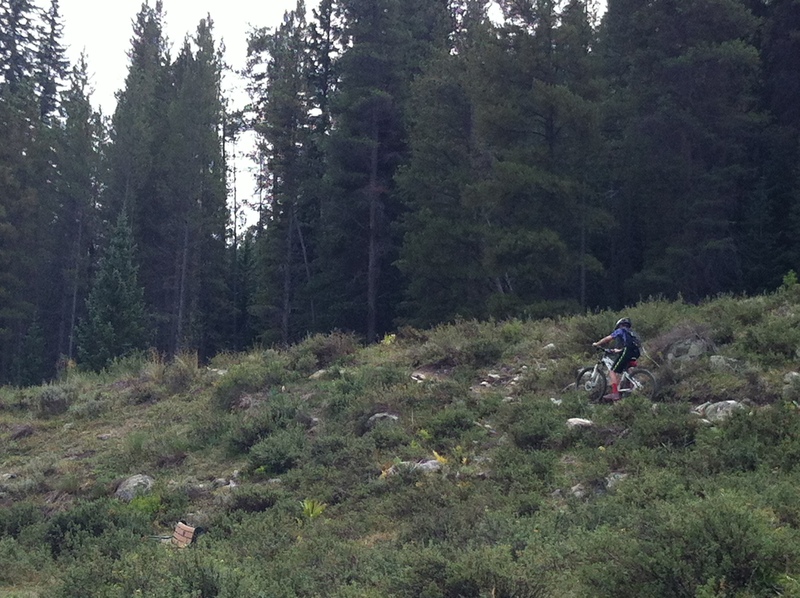 It’s hard to be irritated while coasting down a hill. Fighting to make it up a hill is good for your body and your ego. A bike ride almost always leads to an unexpected adventure. 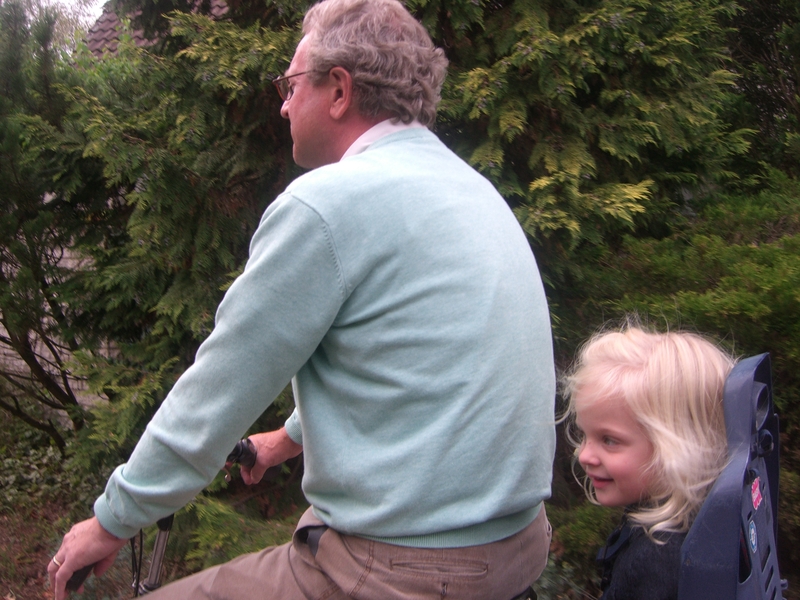 Biking is fun for all ages! While we aren’t purists, my family enjoys biking around our Austin neighborhood, and we are very lucky to live close to my daughter’s school as well as local services like bakeries, restaurants, libraries, and snow cones. Being out and about in the ‘hood often results in delightful and unexpected encounters with the folks around us. 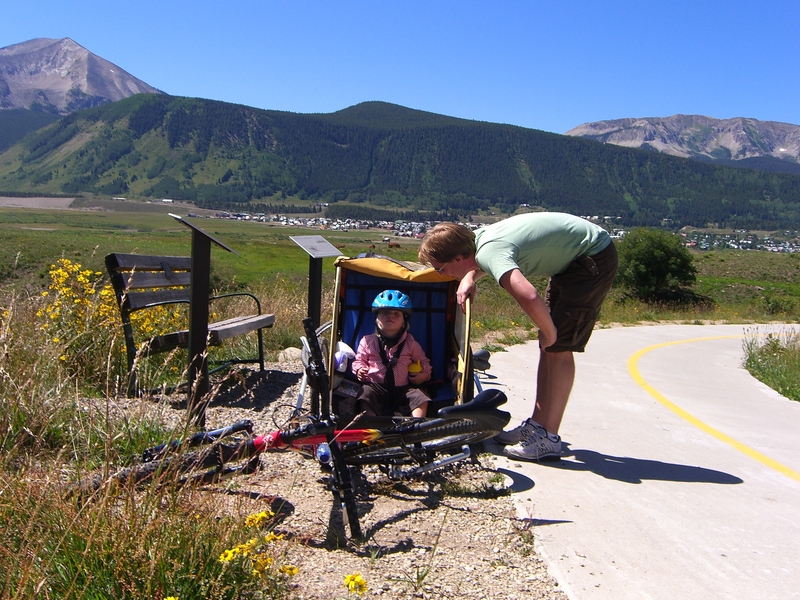 The Sweet Ride: This was our first summer in Crested Butte. Our girl was two, and she loved being toted around in the bike trailer. Snacks, books, stuffed animals and a sweet ride with a good view. Wheeeee! For the chauffeurs, the ride down was, admittedly, more fun than the ride up. 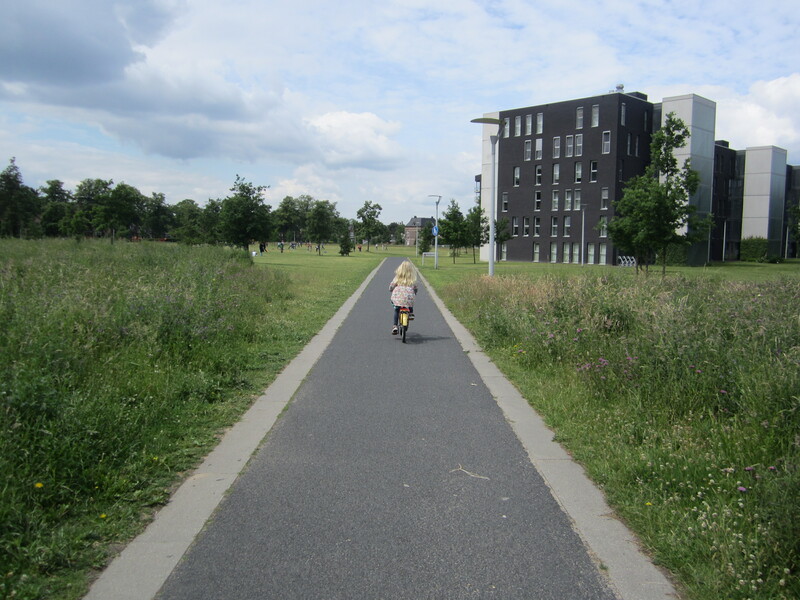 The Practical Pedaler: Several months later, she took another sweet ride with her Opie in the Netherlands. I’m not sure who enjoyed it more. 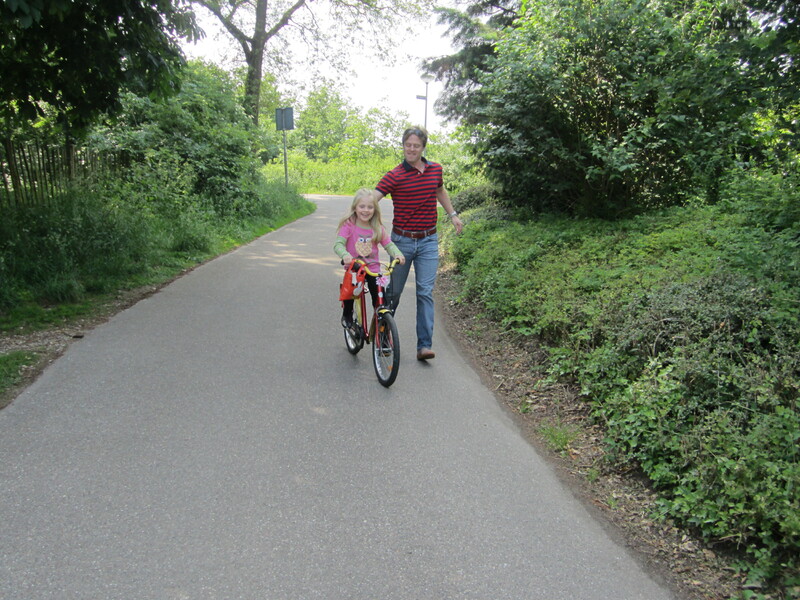 This is how most Dutch families get from A to B with baby (and groceries and laptops and diaper bag) on board. The Tag Along: The next summer, we took an awesome trip to Boston, Vermont and Maine. 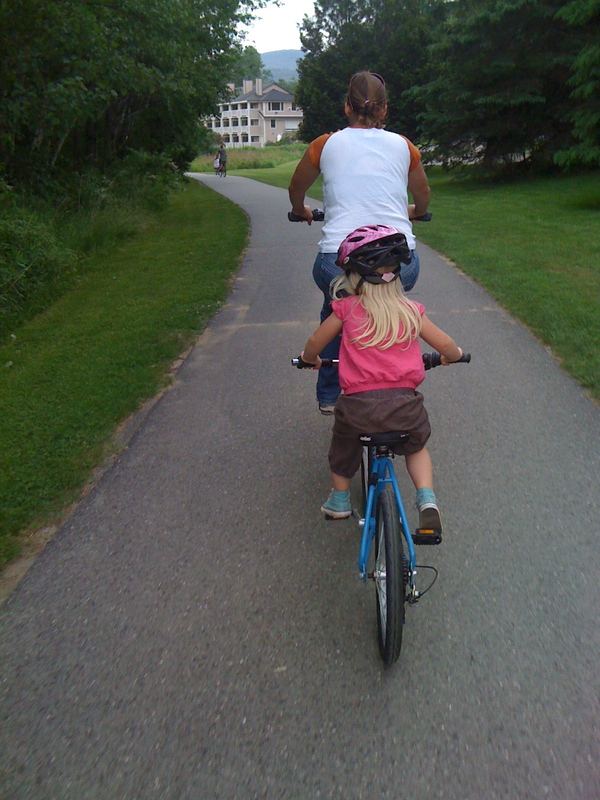 She was big enough to pedal on her own, though she could not be trusted to watch the road…or steer. Our solution in Stowe was to rent a tag along so she could get the satisfaction of (sort of) pulling her own weight while rubbernecking. The Improvisation: A year later, when Stella was almost five, we took a family vacation to Rosemary Beach. We’d gotten wind that her younger Dutch cousin had learned to ride without training wheels when her Dad (Jasper’s brother) improvised a device to help her stay upright. 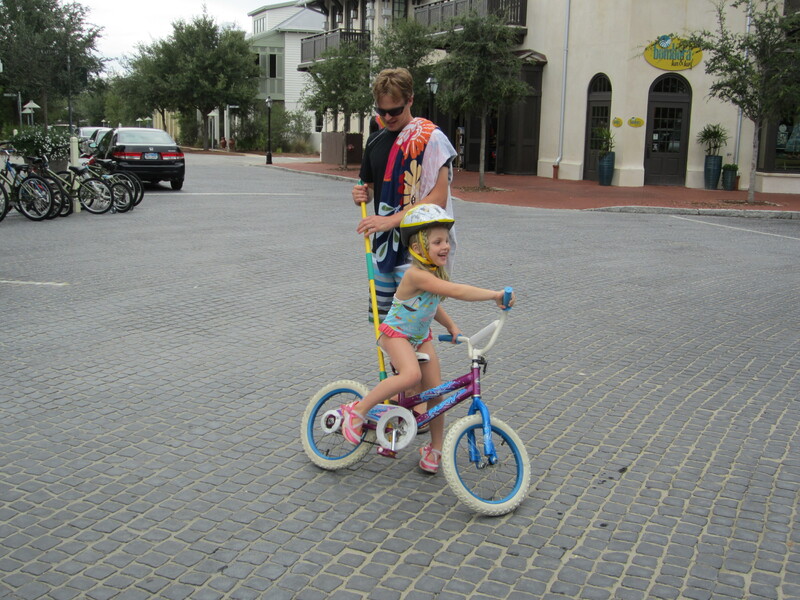 If you’ve been to Rosemary Beach or Seaside or Watercolor, you know that the area is impossibly Mayberryesque and, therefore, the perfect place to learn how to ride a bike. It went well here, and after a week of being led around by a broom handle, Stella actually did ride about 20 yards over a grassy area by herself. Going Dutch: All of the progress made in Florida was wiped out with one nasty fall on the mean streets of Dallas and we went right back to training wheels. The next summer, we traveled to Holland where, on the second day, Stella got in touch with her Dutch roots and came pretty darn close to biking alone. Staying upright was easy peezy lemon squeezey, but steering and paying attention were still a work in progress. I should have taken a picture a few seconds later, when Stella was immersed in the pretty Dutch scenery. 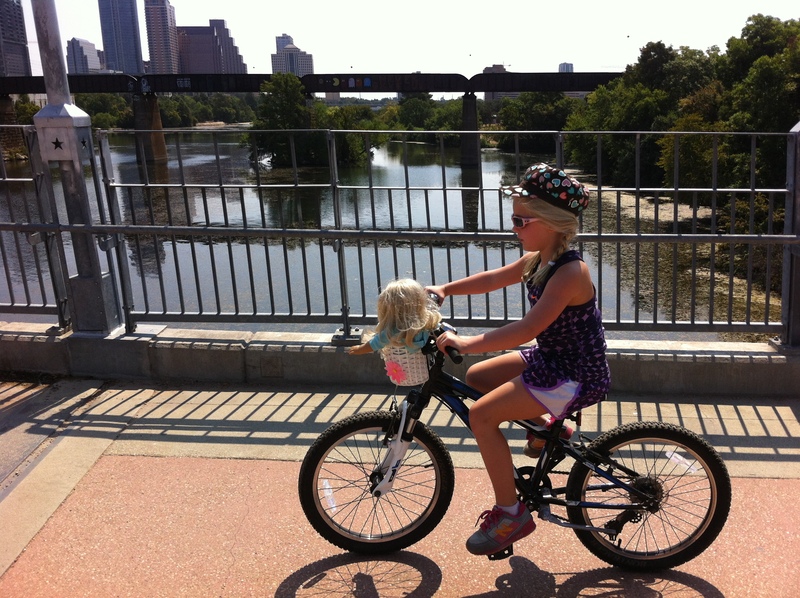 The Staycation: Austin is a great town for biking with kids…particularly if you remember to bring toys and band-aids for blisters. If you forget the band-aids, your kid may become despondent at mile 4.5 of a six-mile loop. Footnote on Fietsen: One of our Dutch friends said learning to bike (fietsen) in Holland is a necessary skill, like learning to swim. It’s not something he ever really remembers being “fun” as much as simply part of the daily routine. 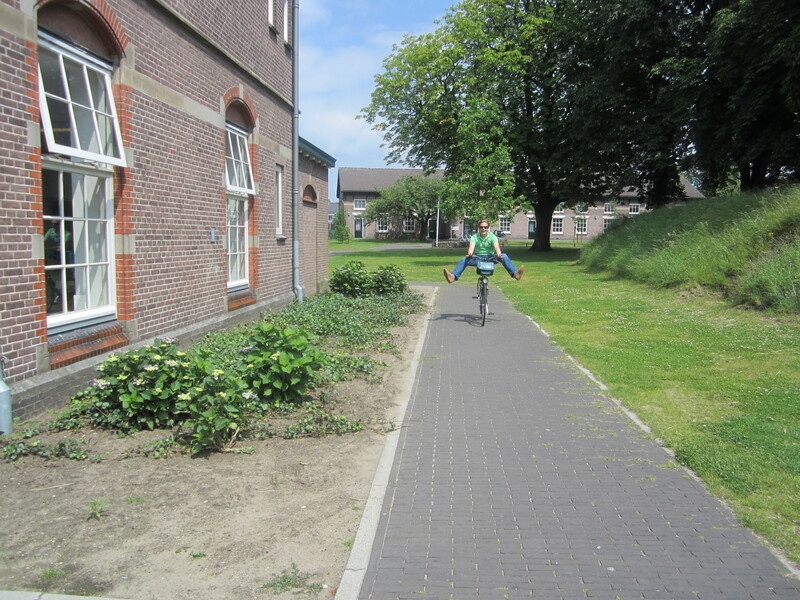 While I think the Dutch biking culture is completely awesome, I think the loss of that fun factor is kind of sad. Luckily for all of us, Jasper has acquired a slightly less practical perspective on biking. 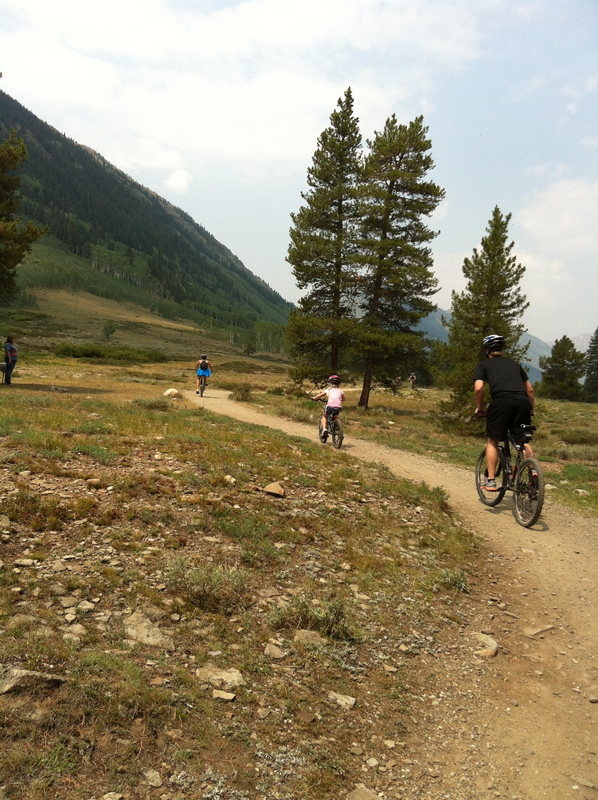 This entry was posted in Family Travel, Parenting, Uncategorized and tagged Biking, Netherlands, Rosemary Beach, Summer in Crested Butte, Vermont with Kids by Jill Coody Smits/ little traveling seeds. Bookmark the permalink. Dankjewel, Noukie! Wij zullen nog meer herinneringen maken deze zomer.